Estonian mobile network operator EMT is promoting the use of NFC by making tags available in all its stores across the country. The tags work in conjunction with an Android app called EMT NFC Starter, a branded version of Tagstand’s NFC Task Launcher that is downloadable from Google Play. An NFC payments trial in partnership with Estonian banks is also set for the spring, the carrier says. 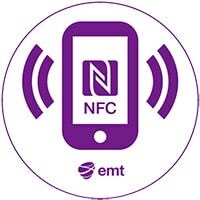 There are currently 22 different NFC phones available through EMT, says the operator, with approximately 20,000 in circulation already.